• Peritoneum – Art Installation at Arizona State, Student Award of Excellence to Arizona State students. • Asphalt to Ecosystems: Design Ideas for Schoolyard Transformation – Communications Honor Award to Sharon Gamson Danks, Bay Tree Design Inc., Berkeley, CA. • The One Ohio State Framework Plan – Analysis and Planning Award of Excellence to Sasaki Associates, Watertown, MA. 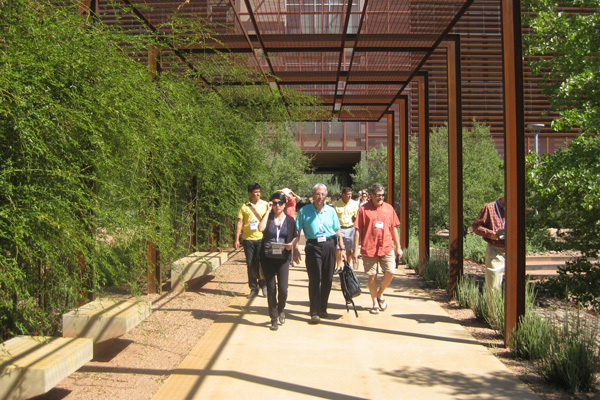 • Arizona State University Polytechnic Campus New Academic Complex – General Design Honor Award to Ten Eyck Landscape Architects, Inc., Phoenix, AZ. 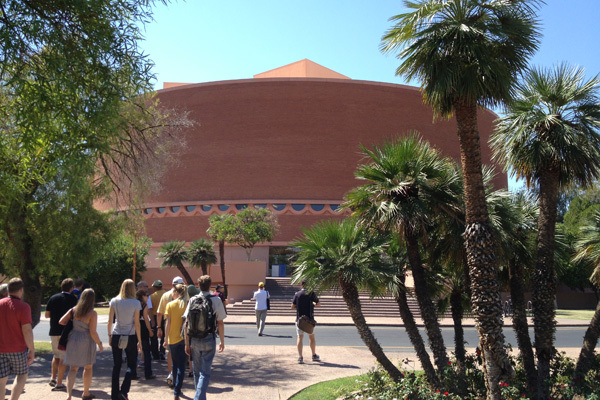 There were two great campus tours, one of Arizona State University in Tempe, and the other of the Arizona State Polytechnic campus in Mesa, Arizona. At times, temperatures were over 100 degrees, but we managed to find shade in the beautiful Palo Verde trees that are truly a signature tree of the desert. The Arizona State University’s Tempe campus is approximately 600 acres, a short light-rail ride away from downtown Phoenix. Current enrollment is about 60,000 students on the main campus. Byron Sampson, the campus landscape architect, and his staff provided an all-day walking tour highlighted by visits to the Grady Gammage Memorial Auditorium (designed by Frank Lloyd Wright), the new Valley Metro Light Rail Stop with its sustainability features and bike station, Cady Mall, the historic Palm Walk, Old Main, and a wonderful lunch on the upper patio at the Memorial Union. There was a special tour of the ASLA award winning Biodesign Institute site and the newly opened School of Earth and Space Exploration with landscape design by Ten Eyck Landscape Architects. The tour ended with an awe inspiring peak at the soon to be opened interactive sculpture by James Turrell entitled “Air Apparent”. For more information on this tour, check out the handouts, which are still available online. 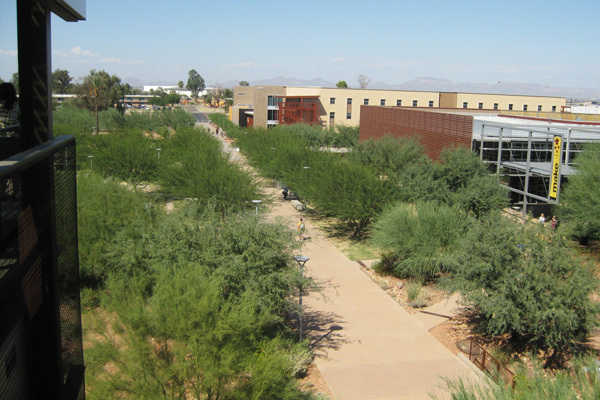 The Arizona State University’s Polytechnic Campus in Mesa Arizona is a former air force base that is in the process of transforming into a beautiful, and environmentally integrated, campus that is a recipient of an ASLA Honor award this year. 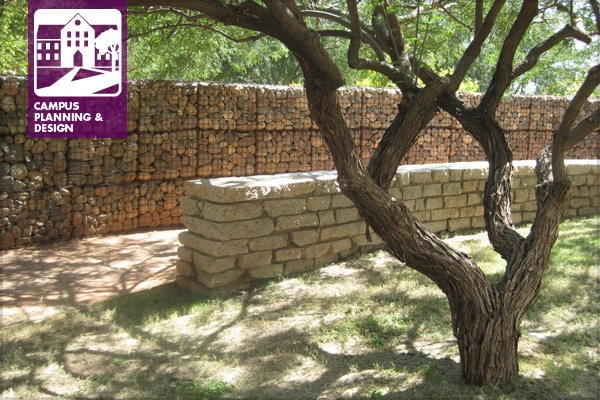 Integration of water systems, desert-appropriate plants, shade trees, and recycled materials all contribute to this educational environment. The tour was led by Roger Socha of Ten Eyck Landscape Architects. The landscape integrated particularly well with the new buildings by Lake Flato Architects. 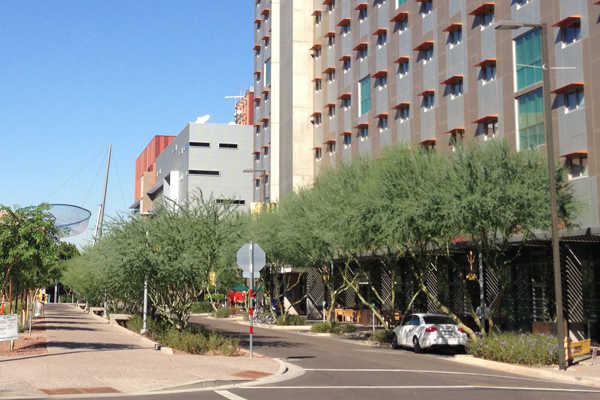 And, without even taking a tour, one could visit the Arizona State University’s Downtown Phoenix Campus, which was located right behind the headquarter hotel. Educational sessions covered many special interest areas related to our work including: design, sustainability, historic resources, clients and consultants, the economy, healing gardens, and other relevant subjects. Two that stood out as sessions that particularly related to Campus Planning and Design were: “Landscape as Sponge: Re-engineering a Historic Campus to Absorb Rain” and “The Campus Landscape Architect: Steward, Client and Diplomat”. “Landscape as Sponge: Re-engineering a Historic Campus to Absorb Rain” was presented by Robert Rock from Van Valkenburgh Associates and Nicole Homes from Nitsch Engineering. This session described Princeton University’s 10-year plan to expand their campus. “The Campus Landscape Architect: Steward, Client and Diplomat” was a presentation where Mark Hough, Duke University; Richard Bumstead, University of Chicago; Mark Novak, University of Arizona, and Mario Nievera, Nievera Williams Design, Inc. discussed the complexity of issues involved in developing a campus (or small city) and the challenge of managing consultants within a tight economy. • Presentation by Dena Kennett, Professional Practice Manager about online communication outlets for all PPNs – The Field and LinkedIn. Remember, you can subscribe to notices with your own preferences for delivery (check the sign-in box in the upper right-hand portion of this page). It was agreed to that LinkedIn is the better format for dialogue and conversation, while The Field is the better format for publishing articles or in-depth information. • Webinars – The Campus PPN would like to present one or two Webinars during the coming year. The first will be a presentation of 2012 Landscape and Planning award winners from the Society of College and University Planners (SCUP) and the trends that the jury noted. Any Campus PPN members interested in planning or presenting a second webinar should contact Cathy Blake. A presentation that has been already made at a local or regional meeting, or even the annual meeting, would be an appropriate topic for the Webinar. • Other topics—Other areas related to Campus Planning and Design that participants had questions or issues about included smoking, cell phones, moped and bike parking, campus visibility at ASLA, the relevance of SITES and LEED to campus planning, maintenance, and post-occupancy evaluations. If you are interested in continuing the conversations on these or any other topics, please post your comments on the Campus PPN Linked-In page. Also, if you have indepth comments on these or other topics, these can be posted here on The Field. Thanks to all who attended the meeting and our PPN.